A summer barbecue with chips, dip and grilled pork chops is a classic American meal. Grilling pork can be tricky, though. Pork is a meat that cannot be consumed undercooked like beef. How long you need to grill a pork chop is not clear cut, but certain methods need to be employed to ensure that the pork is cooked to perfection. The first consideration is the desired doneness. 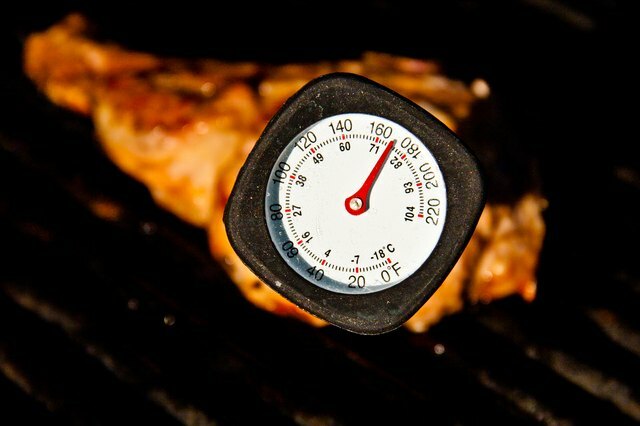 In order to properly grill a pork chop, you must have a meat thermometer. This gives you the internal temperature of the pork chop when you test it by sticking the end of the thermometer in it. According to the USDA, pork should be cooked to a temperature of 160 degrees Fahrenheit. This creates a well done pork chop. Pork can safely be cooked to a temperature between 150 to 160 degrees. This leaves the pork chop slightly pink and juicy. The point of doneness is your choice, but be sure the temperature is at 150 degrees or above. Pork chops do not come in a standard size. It is the thickness, not the weight, that makes the difference when grilling. 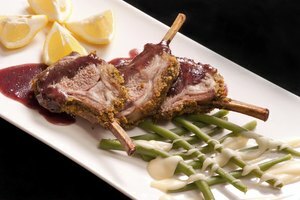 For a half-inch-thick pork chop, it will take about five to seven minutes on direct high heat. High heat is around 450 degrees Fahrenheit on the grill. A three-quarters-inch thick pork chop will take around six to eight minutes on high heat. A 1-inch pork chop will cook in about eight to 10 minutes on direct medium heat. 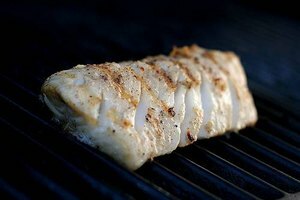 Medium heat on a grill is between 350 and 450 degrees. For a pork chop that is 1&#xBC; to 1&#xBD; inches thick, sear each side for a total of six minutes on high heat, then finish grilling over medium heat for another four to six minutes. 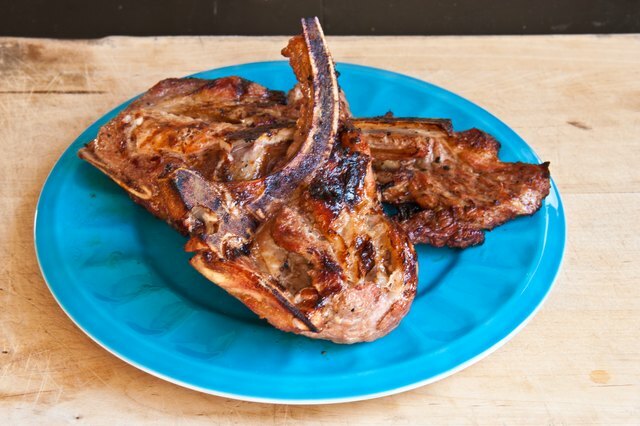 You will need six bone-in pork chops about 1 inch thick and a bottle of your favorite marinade. 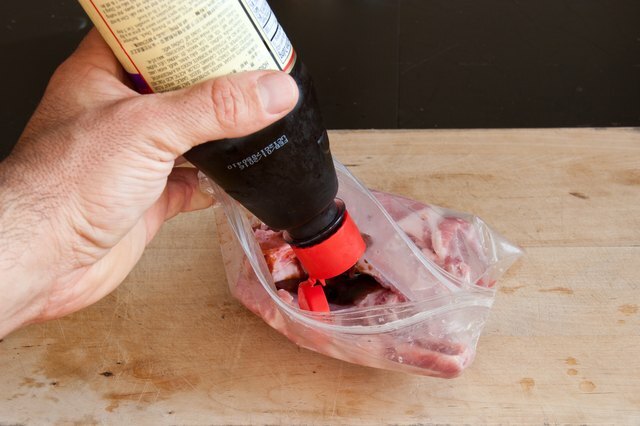 Place your pork chops in a resealable plastic bag and pour in the bottle of marinade. Squeeze out the air and seal the bag. Turn the bag several times and carefully work the sauce around the chops. Be gentle so the bones do not puncture the plastic bag. 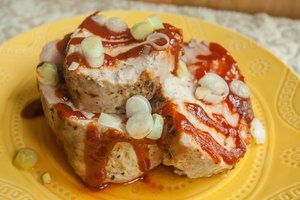 Place in the refrigerator for two to four hours. Remove the pork chops from the bag and throw away the bag. Grill over direct medium heat for about eight to 10 minutes. Turn the meat at least once halfway through the cooking. Remove the pork chops once the temperature reaches at least 150 degree and let the meat rest for three to five minutes before serving.